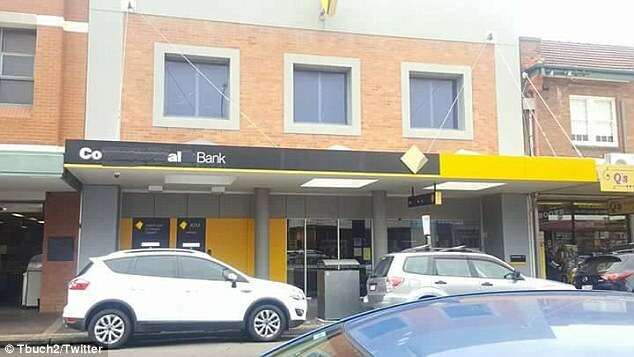 21 Aug 2017 – Environmental activists vandalised dozens of Commonwealth Bank branches to protest its investment in coal projects. 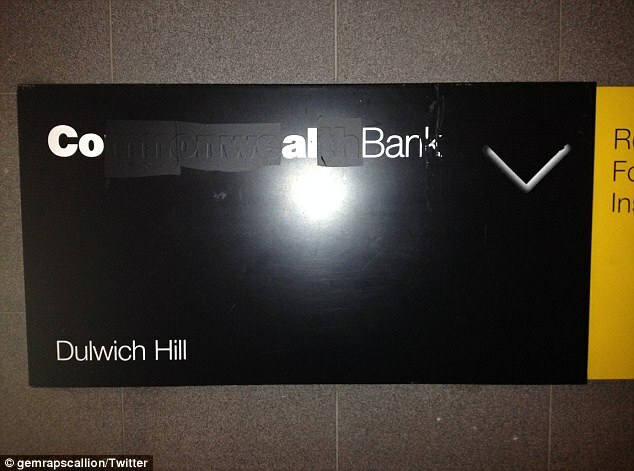 The protesters blacked out letters in the bank’s signs so they read ‘Coal Bank’ as part of an ongoing campaign against the financial giant. Photos of the vandalised branches appeared on social media on Monday tagged with #coalbank with protesters bragging their handiwork. They claimed 25 branches were hit including Earlwood, Dulwich Hill, Bondi Junction and Paddington in Sydney, as well as in Adelaide and Newcastle. CBA is a heavy investor in the coal industry, which is worth more than $56 billion in export value last financial year and supports thousands of Australian jobs. Environmental groups claimed CBA invested $8.86 billion last year and more than $240 billion since 2008, and want it to end immediately. The pressure is aimed at altering the bank’s upcoming new climate policy, which protesters hope will move its investment towards renewable energy. ‘It claims to support action on climate change and keeping warming to below 2 degrees, but at the same time loans billions of dollars to fossil fuel projects that are polluting our world and making global warming worse,’ a petition site wrote. 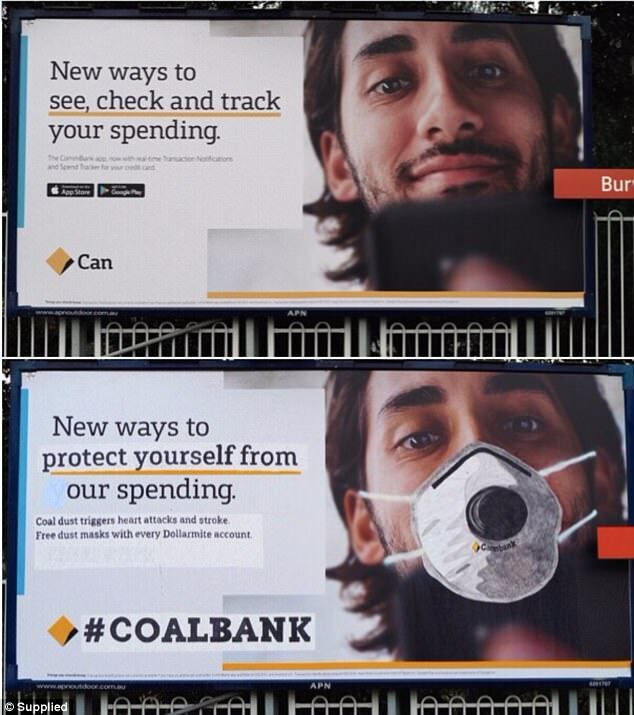 CBA billboards were also defaced in Sydney, with protesters editing them to spread anti-coal messages instead of financial ones. 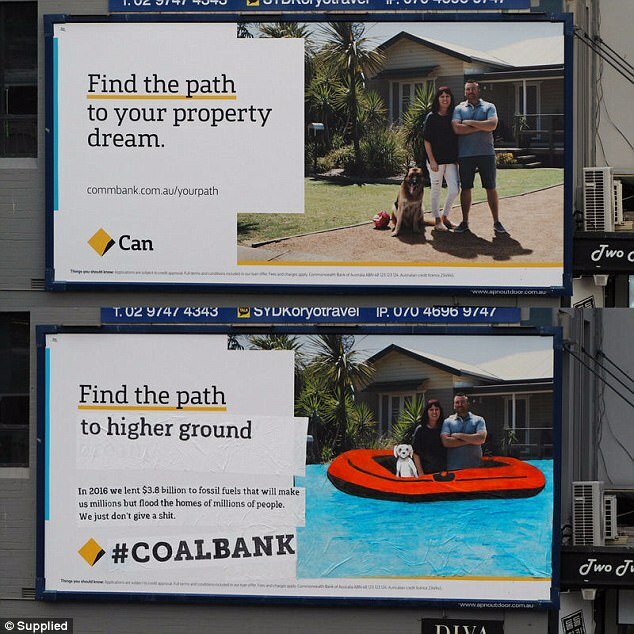 One replaced a family in front of their house with the slogan ‘find the path to your property dream’ with a picture of them in an inflatable raft with the words ‘find your path to higher ground’. 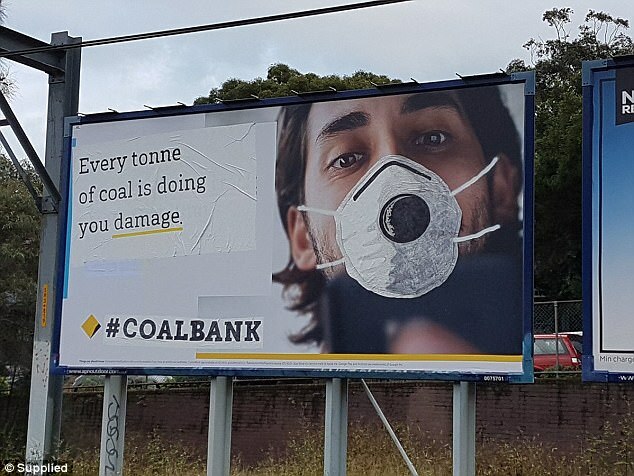 Another put a gas mask on a man with the words ‘every tonne of coal is doing you damage’. ‘There is obviously growing community concern about the Commonwealth bank’s hypocrisy on fossil fuel finance,’ it said. ‘Despite their stated support for the goals of the Paris agreement, CommBank lent more money to fossil fuels last year than any of the other big four banks. 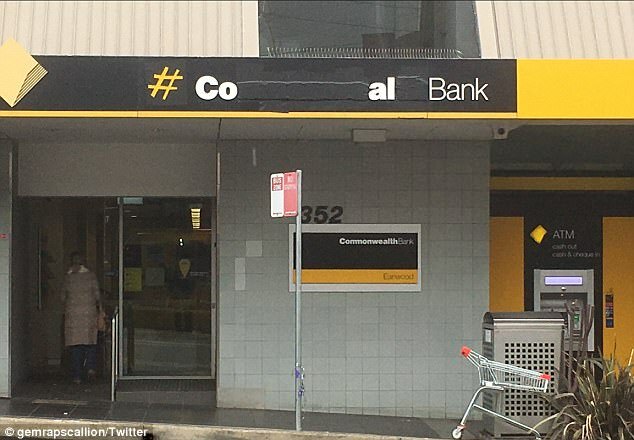 The vandalism follows demonstrators in July shutting down every CBA branch in Newcastle to protest against the bank’s funding of the controversial Adani mine. Dozens chanted anti-Adani slogans while forcing the bank to close their 11 locations for the day. 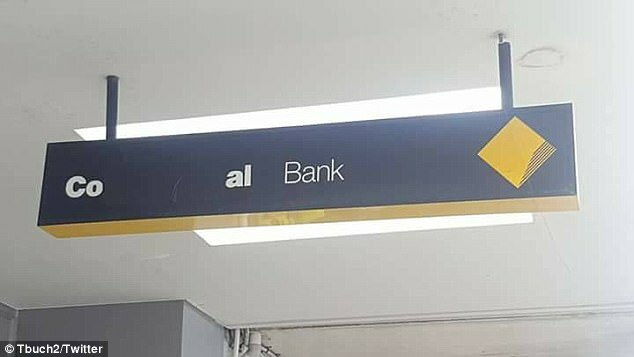 It continues a bad couple of months for the bank after it was accused of failing to report $77 million in transactions linked to money laundering and terrorism. 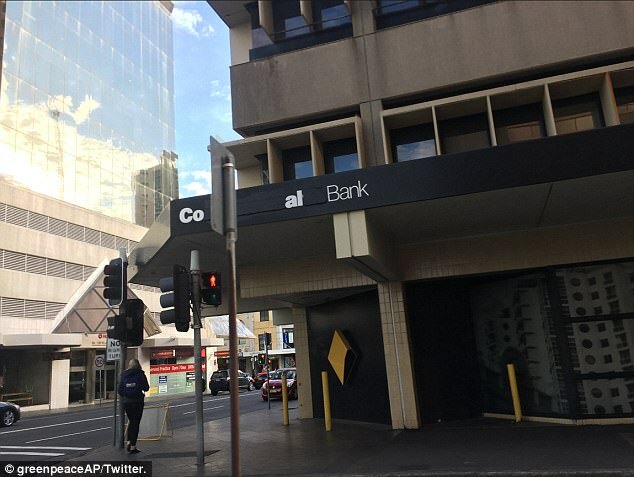 Earlier this month it was then revealed criminals allegedly deposited more than $44 million into CBA accounts, which were not reported due to a ‘system error’. 2 April – In the context of a call for a day of solidarity with the hunger strikers in Greece, some anarchists in Sydney made some small actions. Various slogans were painted and posters in English and Greek were pasted throughout inner west suburbs were many Greek migrants reside. Banners were also hung on highway bridges, and a banner was tied to the façade of the Greek consulate in Sydney CBD, where dozens of leaflets were also thrown. ATM’s of the Delphi bank in Marrickville were also sealed with glue. From Sydney to Greece, against prisons, against police. Victory for the hunger strikers. 325: You can’t jail wolves. You only can jail the body, but you cannot jail the spirit of liberation and the will to keep carrying on attacks against all the enemies. You can shutdown one fighter but the spirit will still live and reach the other corner and spot where you feel safe. You have an eternal enemy who will never step back even though we lost comrades. We, the nihilist anarchists will never stop hitting you until you are ashes. We are the pole out of your poor understanding regarding what is anarchy and chaos for us. And yes we are terrorists, the one who fought for freedom from hundreds years ago with fists, rocks, molotovs, incendiaries and of course, bombs. 26 June: A Facebook video has helped police arrest a teen who allegedly vandalised a Northcote bank in February. Police say two young males were captured on CCTV kicking in the front window of a High St bank in Northcote just after midnight on February 24. An 18-year-old Reservoir man was arrested last week following an anonymous tip off. Police had posted the video footage on their “Eyewatch” Facebook page. Indymedia. In the early hours of the 10th of March, exactly two years since Lambros Foundas was gunned down by uniformed pigs in the street of Athens, some anarchist vandals targeted the Marrickville branch of the Beirut Hellenic Bank. We sprayed “BURN BANKS” “FOR LAMBROS” “FOR SOCIAL REVOLUTION” on the windows of the bank, put superglue in the ATM card slots and covered the screens with paint. This minor act of sabotage was carried out in memory of Lambros, an anarchist, social fighter and member of Revolutionary Struggle. He lived with the courage and conviction to translate his anti-authoritarian beliefs into action and he died on his feet, for that we will never forget him. Eternal Honour to Lambros Foundas, Solidarity with the Revolutionary Struggle and Immediate Freedom for Pola Roupa, Nikos Maziotis and Kostas Gournas. For generalised attacks on all machinery of capital and the state! At the end of January 2012, some comrades in Gorontalo, Northern Sulawesi, Indonesia, made an action of solidarity to Eat & Billy, imprisoned members of the Long Live Luciano Tortuga Cell – International Revolutionary Front / FAI and other imprisoned anarchists. They sealed 4 ATMs from different banks around the city, by filling the glue in the card channel, covering the monitor with oil paint, and writing some solidarity slogans on the walls. They left two communiques in two different places of action, to be claimed under the name of Vandals for Solidarity Cell – International Conspiracy of Revenge / FAI Indonesia. We only just received this news now, the communiques were “never found” and the media surpressed information of the sabotage. In the early hours of the 24/12/2011 we attacked the Mountain Gate branch of the Commonwealth Bank with rocks causing some damage to windows in a small, spontaneous expression of nihilistic solidarity with our comrades fighting the state both here in Australia and all over the world. By choosing to report an incident here, we make no claims as to the (political) motivations of any actors. We just want to amplify the news of incidents that shatter, however briefly, the myth of consensus and social peace, and show that various forms of resistance are possible - are present - here. Information is drawn from published sources, both independent and corporate media; corrections are welcomed. You can read an interview about the project here.